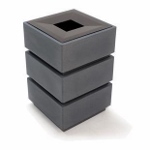 Take a look at our wide selection of concrete trash can products. All of our outdoor concrete trash cans are offered at the lowest prices with the highest of quality. Whether you're looking for a precast concrete garbage can, or an outside trash can made of concrete you will find what you're looking for at TrashcansUnlimited. We invite you to click on any link or picture to find detailed information on all of our outdoor concrete garbage can and waste receptacle products. Click to View SITE-FURNISHINGS-CATALOG-2017. Click to View Available Concrete Finishes. Acid Wash, Exposed Aggregate, Weatherstone, Plastic. Trashcans Unlimited: Find the Right Concrete Trash Can For You! When choosing a concrete trash can there are a few options to consider. First of all there is the finish. You can opt for the most popular which is exposed aggregate or a more contemporary textured weatherstone look, both of which are available in a variety of choices to match any decor. Exposed aggregate is what you will mostly find at various businesses or park settings. They consist of a pebbled rough surface. Weatherstone's textured finish gives the trash container a slightly more decorative appeal. Another thing to consider is if you would like a rigid plastic liner for the inside of the unit. Most of the receptacles include a bag fix system allowing the user to use normal trash bags to hold the garbage. If you opt for the plastic liner all the waste gets thrown into the liner which in turn can be emptied when full. This liner can then be cleaned and replaced back into the waste receptacle for future use. You can also use a trash bag inside the liner preventing the liner from even getting dirty at all. One last thing to consider is this. You may be thinking that since they are so heavy shipping is just going to kill your wallet. That doesn't have to be the case. Freight can be very reasonable as long as you don't get fooled by some who use the weight of the cans as a way to inflate the shipping costs. So now that you know the basics you can feel positive in the fact that concrete trash cans are a great way to dispose of public refuse while still maintaining visual appeal of the surrounding area. Visit TrashcansUnlimited.com for all the options in one place!